Thu., April 6, 2017, 11:08 a.m.
OAKLAND, Calif. – Months ago when the season began, the Golden State Warriors focused all their energy on incorporating Kevin Durant. Stephen Curry and Klay Thompson figured out how to share the shots with another superstar added to the mix, while Draymond Green adjusted to fewer attempts on offense and welcomed another defender who could wreak havoc and block shots. When Durant returns from a left knee injury Saturday barring any setbacks after missing more than a month, he will rejoin a Golden State group on a roll that appears poised for another deep postseason run. The Warriors have said all along they will settle for nothing less than a second championship in three years after last season’s near miss. Durant was medically cleared during a day off Thursday to resume full practice beginning Friday. He is tentatively scheduled to play against New Orleans. Any challenges working KD back into the mix? Golden State’s co-leading scorer along with Curry at 23.5 points per game and the top rebounder, Durant was hurt Feb. 28 at Washington when Marcin Gortat pushed Zaza Pachulia and Golden State’s center fell into Durant, who has missed 19 games since with a Grade 2 MCL sprain and bruised tibia. When Durant went down, Golden State had to find a way without him – and it wasn’t pretty for a while. The Warriors lost four of their next six games, suffered consecutive regular-season defeats for the first time in nearly two years and even experienced a three-game skid for the first time since November 2013. They played eight games in 13 days with two cross-country trips, a return for one in Oakland before back-to-back defeats at Minnesota and San Antonio on March 10-11. No losses since. A season-best 13-game winning streak, the NBA’s best record and No. 1 seed in the West for a third straight season. Opposing coaches can only brace for what the Warriors will look like when the playoffs begin next week with even more firepower. 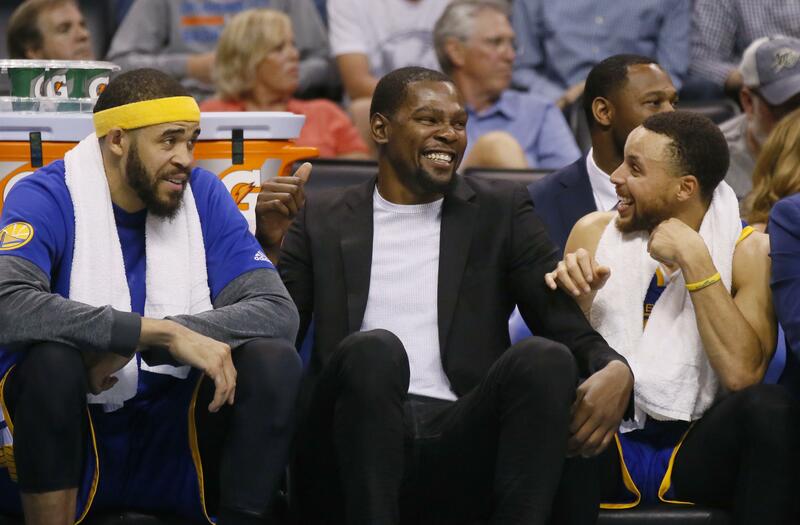 Coach Steve Kerr can crack all the jokes he wants about Durant’s impending return. Yet Kerr can and will be cautious in how much he plays Durant right away, especially given how great the supporting cast has performed. From Shaun Livingston and Andre Iguodala to newcomer Matt Barnes, who was added when Durant got hurt, Ian Clark and JaVale McGee, Golden State has received strong contributions from just about everybody on the roster during KD’s absence. Curry and Thompson have found their shooting grooves, too. Published: April 6, 2017, 11:08 a.m.